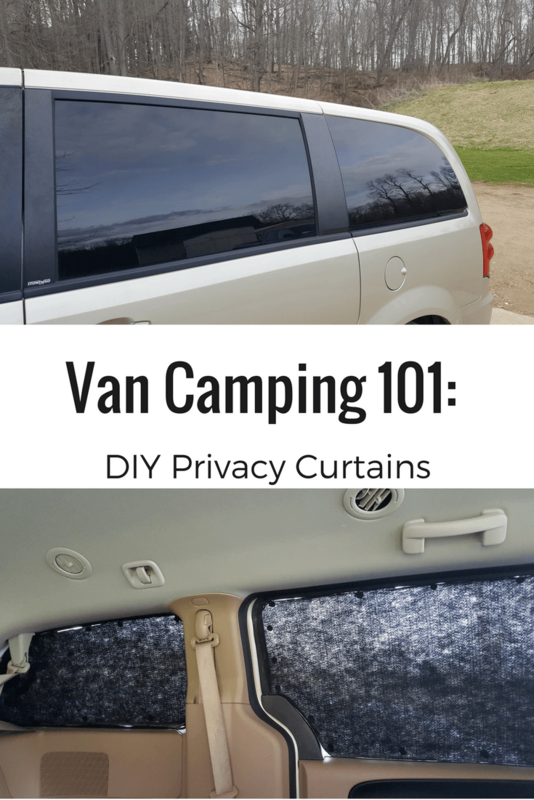 The second post in the series about van camping, I show you how to create easy DIY privacy curtains for your vehicle using few materials. Let’s face it, if you’re van camping, the last thing you want to do is to wake up to see someone’s face pressed up against your window. I’m not sure why someone would feel compelled to do that, but that is one of my fears while trying to sleep in the van. That someone will see me sleeping. Weird. I know, but it does keep me up at night. The things I ponder. 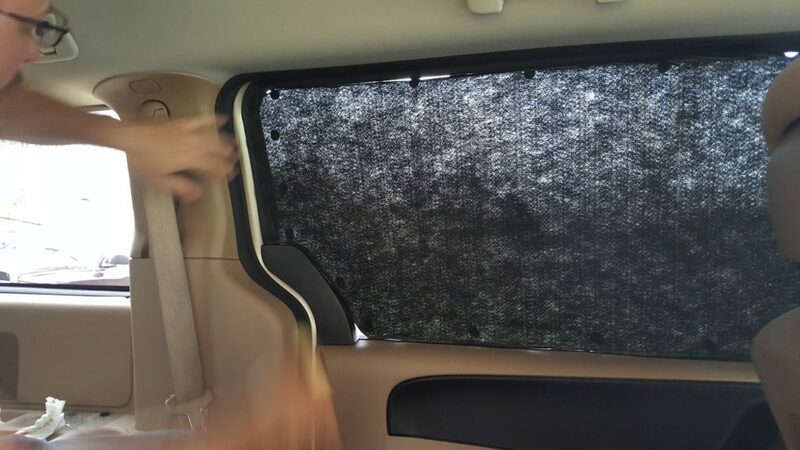 Privacy curtains are also helpful to block out the lights if you happen to pull into a rest stop or Walmart parking lot for the night. When I was researching van curtains I found several options. Most involved attaching a piece of wire or heavy duty string or something similar across the windows to create something very much like curtains. My husband and I wanted something different. 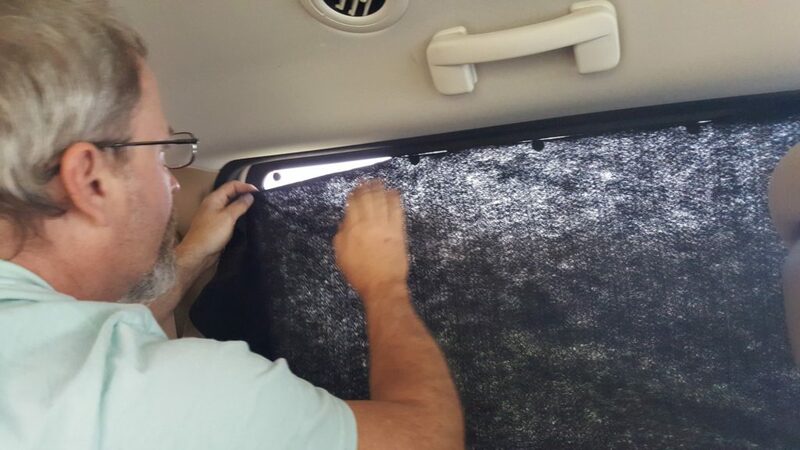 Since I use my van on a daily basis and I don’t always want it to look like a van camper, but I want it to be easy to transform in a moment’s notice, it was important that the curtains be extremely easy to affix. I think we came up with the perfect solution. 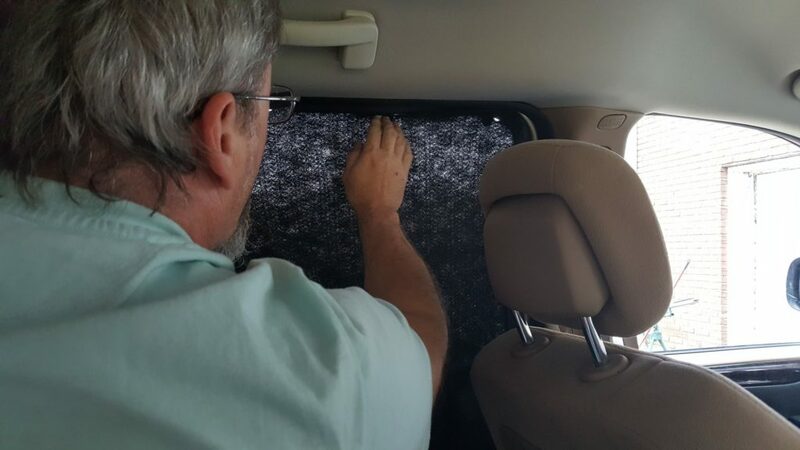 Cut a piece of felt to the approximate size of your van window. Hold the felt to the window and with the chalk, outline the shape of the window. The chalk easily rubs off. Cut the felt to fit the window. Add the Velcro hook & loop dots to the window in 2-3 inch intervals around the entire window. Affix the felt “curtain” to the Velcro. Carefully separate the Velcro pieces to remove the felt curtain, leaving one piece (the hook or loop, it doesn’t’ matter) on the window. 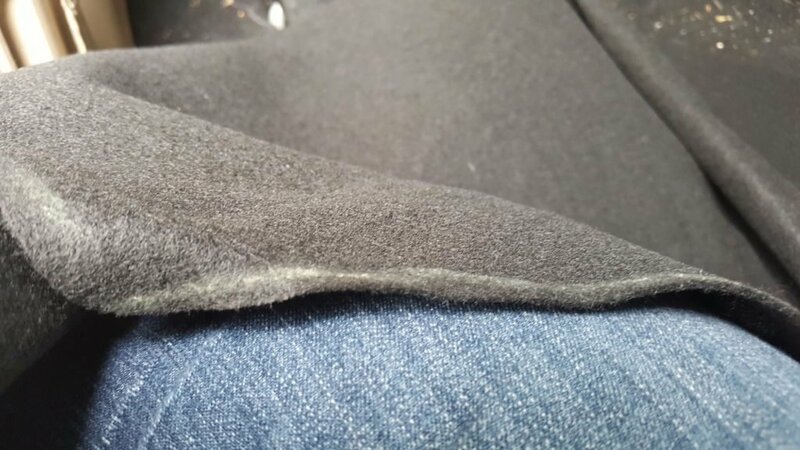 The Velcro doesn’t stick well to the felt. I was going to hot glue the felt but my husband suggested that we staple the Velcro dot to the felt which was much quicker and worked perfectly. One side of the dot remains on the window at all times which allows the curtains to be adhered and removed from the windows in minutes. 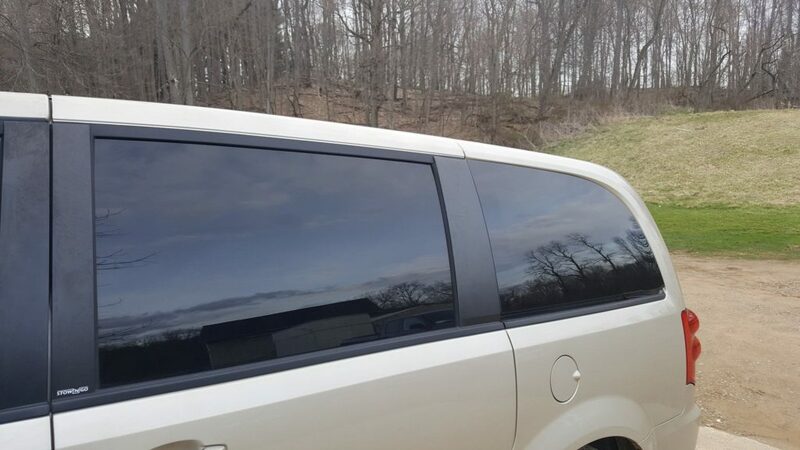 Since our van windows are slightly tinted the felt isn’t even visible from the outside of the van when it’s in place. We’re now one step closer to van camping. Did you consider small suction cups? We didn’t because the velcro was easy to attach to both the felt and the windows and attached the fabric securely with no gaps. I wanted to make sure the fabric fit flush against the window so when we were inside watching TV, etc. no one outside would be able to see inside through gaps in the fabric. Does extreme heat cause the velcro dots to fall off the windows? We haven’t experienced any issues with the Velcro dots. 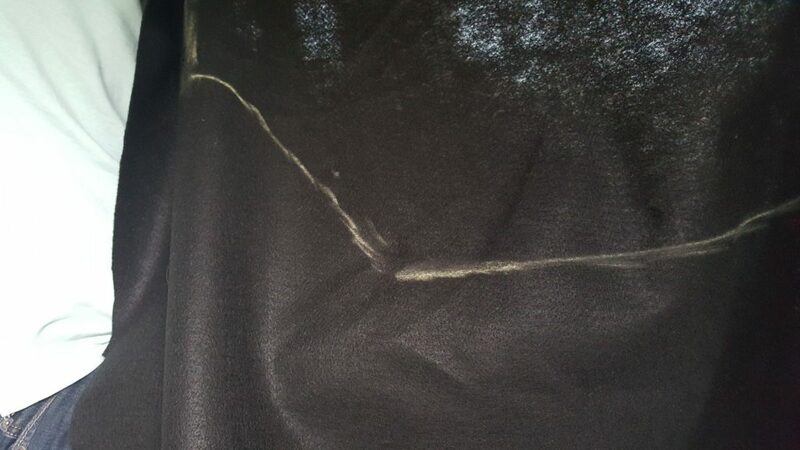 We did recently travel in my husband’s Dodge Promaster Van and used Velcro on the walls to hold slipcovers and noticed when it got hot the velcro wouldn’t hold the slipcovers but the velcro that is attached to the van is near impossible to come off. 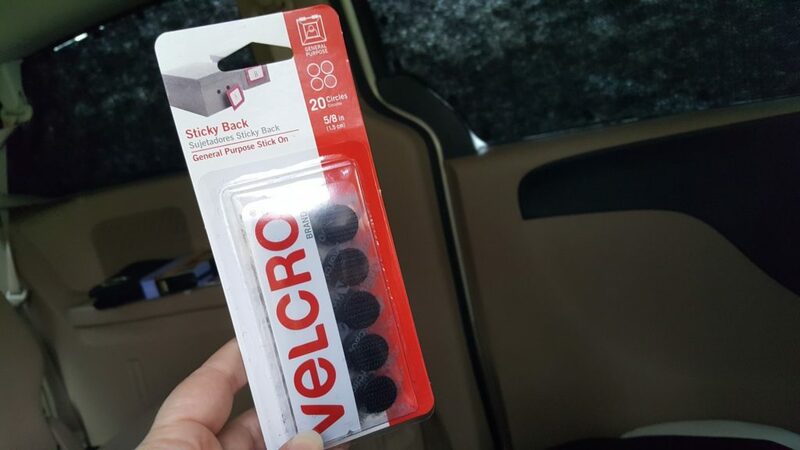 In the minivan, as this post is about, we stapled the velcro to the felt so it has held up perfectly. If you plan to camp in hotter climates, make sure you attach the velcro to the fabric in a way that it won’t come apart when things heat up- glue, staples, sew them, etc. but it’s been my experience that the other side of the velcro fastens and sticks tight to the vehicle. Does that make sense? Thanks for the detailed description and the pictures! I was wondering how you’ll go about opening the windows now that the velcro dots are attached to it at all times? Hi Annelieke, This is an interesting and thoughtful question! The back windows in our minivan do not roll down so this wasn’t something that we needed to consider. 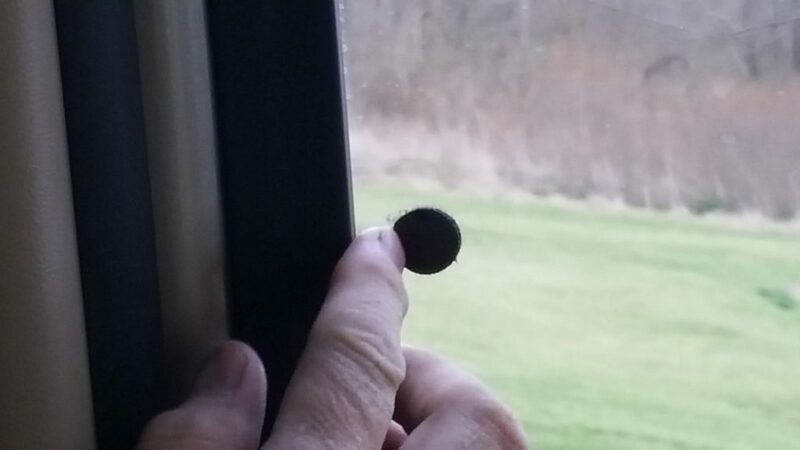 If so, I think I would have tested the other velcro dot – not the one I placed on the windows but the one I added to the felt because it is thinner. Our far back windows do open but they push outward which again, is not an issue. Our back window does not roll down either. I hope this helps! Thanks for your question!